The Living Goddesses crowns a lifetime of innovative, influential work by one of the twentieth-century's most remarkable scholars. Marija Gimbutas wrote and taught with rare clarity in her original--and originally shocking--interpretation of prehistoric European civilization. Gimbutas flew in the face of contemporary archaeology when she reconstructed goddess-centered cultures that predated historic patriarchal cultures by many thousands of years. This volume, which was close to completion at the time of her death, contains the distillation of her studies, combined with new discoveries, insights, and analysis. Editor Miriam Robbins Dexter has added introductory and concluding remarks, summaries, and annotations. The first part of the book is an accessible, beautifully illustrated summation of all Gimbutas's earlier work on "Old European" religion, together with her ideas on the roles of males and females in ancient matrilineal cultures. The second part of the book brings her knowledge to bear on what we know of the goddesses today--those who, in many places and in many forms, live on. 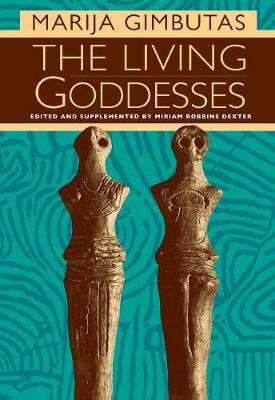 "Wide-ranging and fascinating, "The Living Goddesses "should intrigue the curious and delight most feminist scholars." --"Library Journal"
Marija Gimbutas (1921-1994) was Professor of European Archaeology at the University of California, Los Angeles, and Curator of Old World Archaeology at what is now the Fowler Museum of Cultural History. She is the author of Goddesses and Gods of Old Europe, 7000-3500 b. c. (California, 1982) and coauthor, with Joseph Campbell, of The Language of the Goddess (1995). Miriam Robbins Dexter, who holds a Ph.D. in Indo-European studies from UCLA, is a lecturer in the Honors Collegia and in the Program in Women's Studies at the University of California, Los Angeles. She is author of Whence the Goddesses: A Source Book (1990).